Hundreds of ideas for creative ways to eat, make & decorate! Plastic pumpkin candy buckets are pretty much the universal symbol of Halloween. They bring back childhood memories of lugging one around from house to house, trick or treating your way through a neighborhood. Fast forward to being an adult, and I can definitely say that plastic pumpkins are still the first thing that pops into my head when someone mentions Halloween. But let’s look past the candy dish – because there are so many great ways to use them for decorating! And since you can pick them up at almost any dollar store, these Halloween ideas are budget friendly, too! Grab a few dollar store pumpkin buckets and make this tipsy pumpkin planter - isn't it adorable?!? So the next time you take a trip to the dollar store, be sure to grab a few plastic pumpkins (or a whole truckload!) 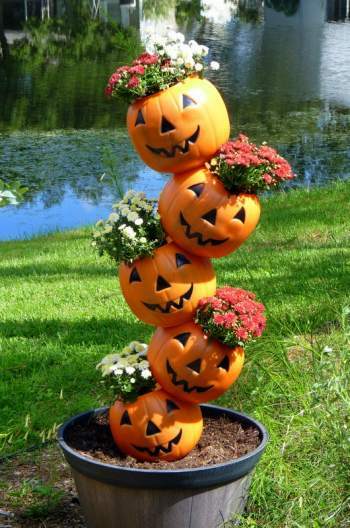 With just a little imagination you can turn them into something awesome for your Halloween decorating. 20 pretty pumpkin ideas – just in case you’d rather have the real thing, these ideas are great inspiration on ways to make them beautiful for fall. 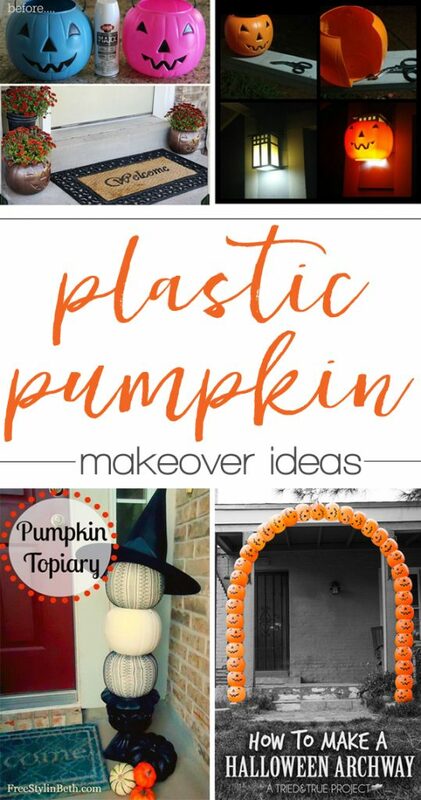 Halloween porch decorating ideas – of course, you can take a few of these plastic pumpkin ideas and put them together with a few porch decorating ideas and have the coolest yard on the block – the one all of the trick or treaters will line up to see. ARE YOU A FARMHOUSE FAN? Get instant access to this free guide to The Best Sources for a Farmhouse Style Home on a Budget! Gina Luker is a writer, photographer and lover of all things quirky. She's usually found with a drill in one hand and a cocktail in the other while blogging along the way. She's addicted to coffee, polka dots, rock stars, Instagram, and everything aqua.